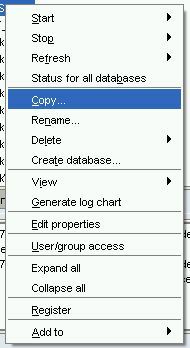 From 11.1.2.2 onwards you can no longer take an copy of a Planning BSO Application through EAS. You can still copy ASO apps and Essbase only BSO apps, but can no longer take a quick snapshot of a Planning app to do some modelling in. The function is greyed out when you right click on the App. Below is some Maxl code to get around it. This will copy the outlines, rules, scripts and data across. 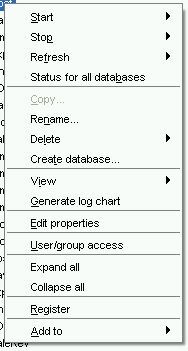 Note the 8 character limit for both apps and databases. Best run from the MAXL editor in EAS. This is a staggeringly inglorious hack, so treat it with caution. It has obviously been removed for a reason – though this may simply be to remove the confusion of planning/essbase apps. You also need to be aware of your licensing agreement to make sure you’ve got coverage for Essbase only applications. ps: I’m kidding. Don’t run this in Production. Seriously. They are Planning apps remember?? That’s why you’ve got LCM. Read the previous post. Sheesh. If, like most of us, part of your day to day role is support – one of the key advantages of using ODI in your overnight process is to have the full gambit of ODI error handling available to you. Errors are nicely caught, with email warnings for failures in batch processes basically a default state. However, what happens if ODI isn’t part of your implementation? What happens if the back end is basically a bunch of batch/maxl scripts hanging together (no matter how elegant it is). If it is the latter, at best you’re unlikely to have an easy method to trap errors and send notifications to the support team and at worst, you may not have any automated notification at all! So you’ve decided to steal cable write your own. While this process would be possible in batch – certainly you’re likely to be better off selecting a more advanced language with slightly better handling of strings (See also: Java/Perl/Powershell/Cygwin/VBA). I’ve gone with Powershell: slightly because I’m generally on Windows environments, somewhat because it’s fairly decent at string manipulation and mostly because it’s one of the few languages I know. So – to start with, basic documentation and variable structure. I’ve written this to poll through a folder containing log files (rules file errors, maxl return errors and an archive copy of all of the Essbase Log files from the previous day). These have been moved to this folder by earlier maxl/batch steps, mostly by using STDERR outputs. For each of the files in the log folder it scans for any lines containing errors and pushes the entire line to a central log file. I’ve added suppression to deal with a majority of ‘false positive’ errors – primarily related to errors in the Essbase log for Smartview user-side errors like ‘you’ve-got-suppression-on-by-default-and-your-top-level-retrieve-is-blank’ (man, if I had a nickel for that one…). Finally it checks if the log file isn’t blank and emails it through to the email addresses listed. The primary reason I’ve got the error suppression above is to make sure you’re only receiving automated emails when something has gone wrong. I find too many false positives in your inbox mean that the actual errors occasionally get lost in the underflow. Finally – the full code in all it’s glory. 20 Lines of working code all up! #1020010 No data was generated: Suppress Missing = [%s], Zeros = [%s]. Sheet not overwritten. #1020011 Maximum number of rows [%s] exceeded [%s]. #1020012 Maximum number of columns [%s] exceeded [%s]. As an aside, I’m aiming to provide full code snippets as often as possible. Most of my learning over the years has been picking up code from everywhere and jerry-rigging it all together. (Subnote: greatest wikipedia ‘Not to be confused with’ ever!). Please feel free to use, send to colleagues, share with friends, or claim as your own to help you pick up ladies. However, standard rules of never putting something into your environment that you haven’t first tested and understood apply. I’m not to blame if it takes these lemons and burns your house down. Hopefully this has given you some ideas as to adding basic error handling to your own environments, allowing you to both rest easier at night and feel like you’re always one step ahead of any problems as they occur!